Poinsettia has become almost synonymous with Christmas. Being native to Mexico, the plant is famous for its beautiful green and red foliage. Not many people know this, but it got its popular name from Joel Roberts Poinsett, the first U.S. Minister to Mexico. He was the one to introduce the plant to the U.S. back in 1825. Leaving history behind, today we are going to focus on how to care for a poinsettia plant to ensure it stay s beautiful even after the holidays. If you want to keep poinsettia looking good, you need to provide them with a sunny place. Preferably, you should choose a south-facing window sill. 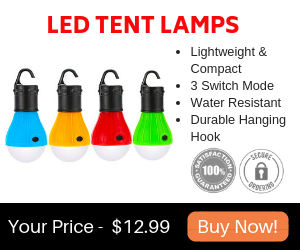 There is also the option for you to offer the plant bright filtered light, in case you don’t have the adequate conditions in the house. However, it’s important not to press them against a cold window since in this way you can damage the leaves. 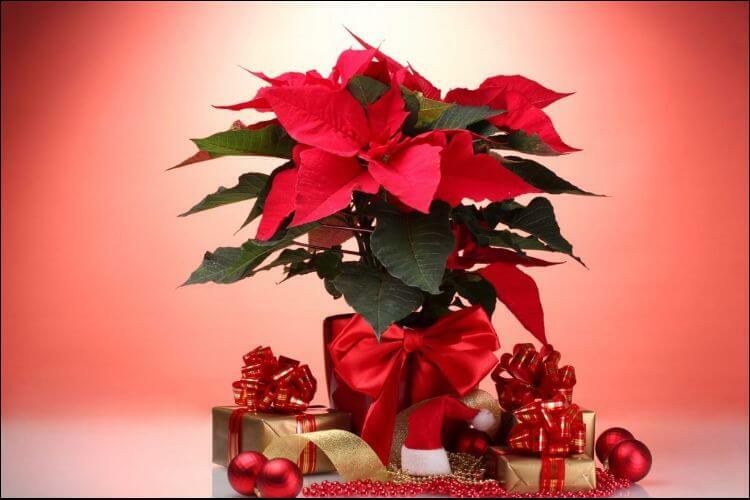 Keep in mind that poinsettias are tropical plants, so they’ll love having as much direct sunlight as possible. 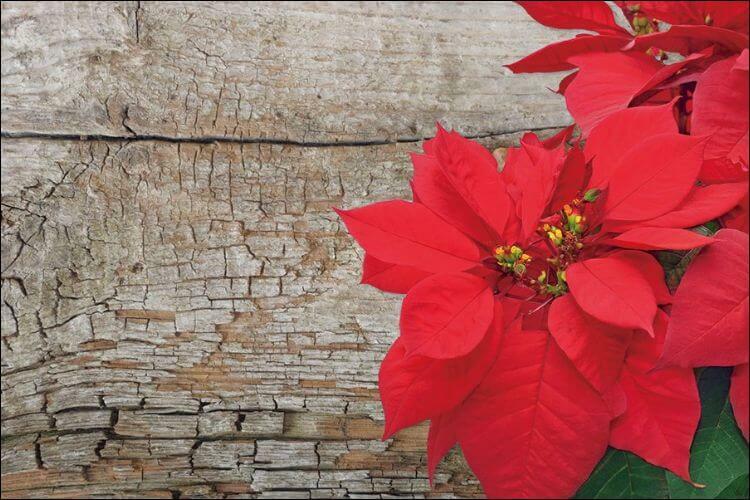 If you want to keep the poinsettia in bloom for a longer period, the ideal temperature during the day is 65 – 76 °F. At night, you can drop the temperature to 60 °F, for instance, since this will not hurt your plant. It’s important to make sure there are no cold drafts, otherwise, you can cause premature leaf drop. A poinsettia that has been exposed to cool temperature or drastic shifts will look leggy when in bloom, with some sad-looking leaves still hanging on there. An important aspect if you want to know how to care for a poinsettia plant correctly is to touch the surface. If it feels dry when you touch it, it’s time for you to water the plant. Keep watering until it drains out the bottom. However, never let the plant sit in water. Wilting is one of the most common causes for which the leaves drop. Luckily, even if your poinsettia is wilted, you can still revive and salvage it. Even so, you will need to spend another season to work on improving its appearance. In the months following Christmas, all you need to do is to keep watering the plant whenever you notice the surface is dry. This is the month when you need to start decreasing the water. Let the soil get dry from one watering to another. You should also keep an eye on the stem, so as not to begin to shrivel. If it does, this is a clear sign that your plant is stressed and dying. In 1 – 2 weeks, the plant should be already accustomed to this drying process. 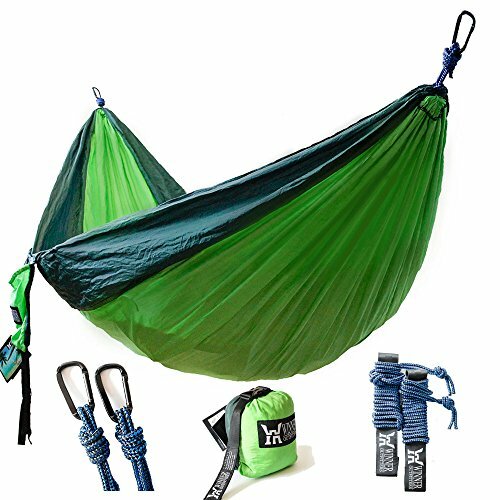 Next, you need to move it to a cool place, such as a heated garage or a basement. 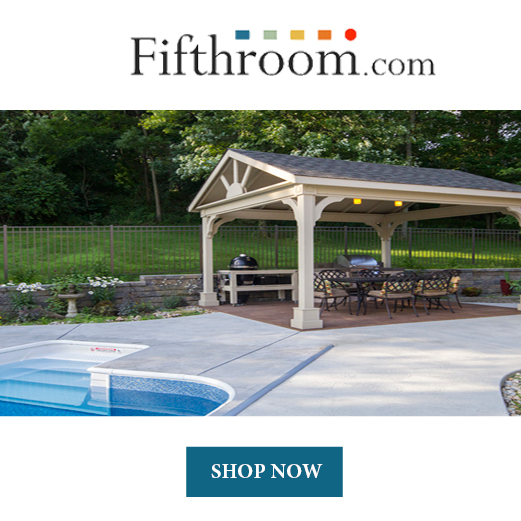 Try your best to keep the temperature above 60 °F. In the middle of May, you need to cut the stems back to 4 inches. Report the poinsettia in a bigger container and use some new potting soil. You will need to water it well. Keep the plant next to the brightest place you can get and set the temperature between 65 and 75 °F. You should keep watering it whenever you see the soil turning dry. When you notice new growth, use some complete fertilizer every two weeks. It’s recommended you read the instructions on the label. Now is the time to move the entire poinsettia outside. Place the pot in a spot with partial shade. Stick to the regular watering and fertilizing schedule. In the beginning of the month, you should pinch back the stems on the plant by 1 inch. In this way, you will encourage it to grow into a well-branched and stout plant. If you don’t pinch it, you will end up with a tall and spindly poinsettia, which you probably don’t want. By the middle of the month, the stems should already have branches and leaves. Again, you will need to pinch and cut the new stems. Leave 3-4 leaves on each shoot. Take the plant back indoors to the brightest place you have. Next, keep watering and fertilizing as usual. Keep watering and fertilizing as usual, but make sure the temperature doesn’t fall below 65 °F. An important part of learning how to care for a poinsettia plant is knowing that it’s a short-day plant. This means that the length of daylight they receive affects the bud set. If you want it to rebloom, you will need to get them 10 weeks with 12 hours of sunlight a day. Naturally, you need to recreate the conditions artificially and be diligent about it. Starting with the first of October, keep it in complete darkness between 5 PM and 8 AM. If you expose it to light during this period, you may delay blooming. To block out the light, you can use an opaque material or even a box. Many gardeners choose to put the plants in a closet, but you need to make sure no light gets in at all. During daytime, move the plant to the sunny window and keep watering and fertilizing it. In the last week of November, you need to stop the darkness treatment and let the plant stay next to the window. By now, you should already be seeing flower buds. As you’re slowly approaching Christmas, you should get ready to enjoy your poinsettia again. By the middle of the month, you should stop fertilizing the plant. Keep watering it and follow the same process you did when it was in bloom and you brought it home. If all goes well, the plant should bloom again. All throughout the process, you need to be careful when you’re handling the plant. 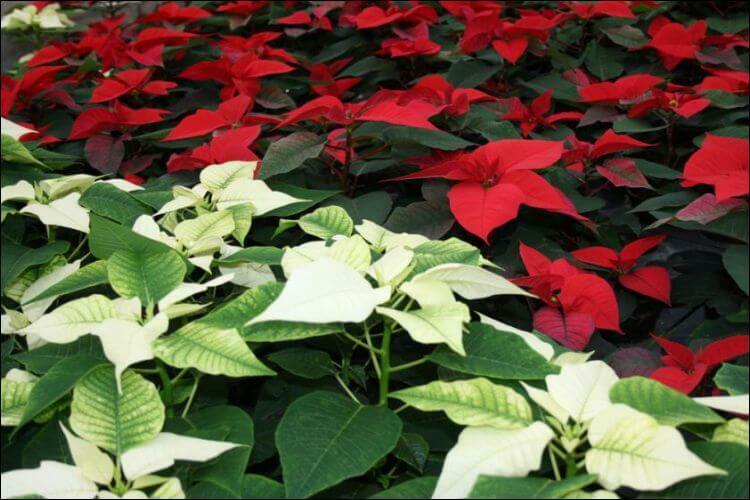 The plant family that comes with poinsettias, called Euphorbias, usually leaks a milky sap when you break it. A large number of people is sensitive to the substance, which usually causes a rash. Don’t rub your eyes after you handled the poinsettia. Wash your hands and don’t pinch or prune them with the bare hands. That’s why you need to take care of yourself first when learning how to care for a poinsettia plant. It may happen that you notice the poinsettia leaves falling off. An important step in knowing how to care for a poinsettia plant is to correctly identify the signs that it’s ill. One of the common symptoms is represented by the leaves falling off. If this happens, you need to pinpoint a couple of possible causes. Most likely, the causes are some environmental factors. For example, the conditions in the room may be warm and dry. Remember that the plant can also get stressed if it suffers drastic changes in a short period. It’s essential to keep it in a draft-free and cool area. Offer it enough water. If you see nothing works, then maybe you should consider getting a new plant and starting from scratch. 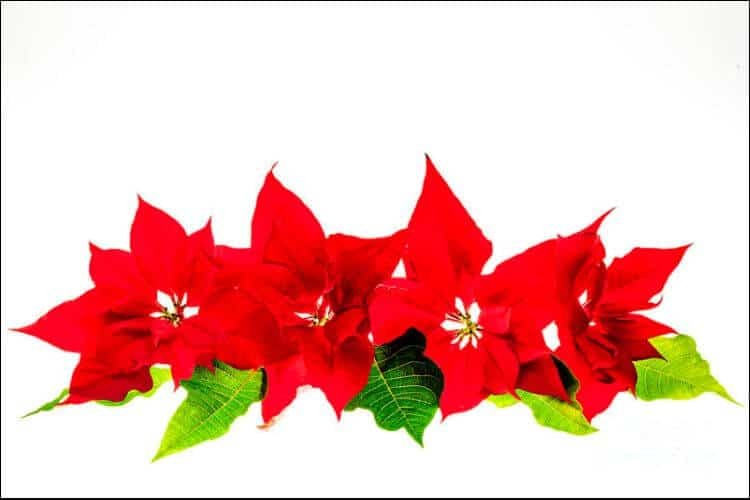 There is this common misconception that poinsettia would be poisonous. For this reason, many people avoid taking proper care of the plant. Clearly, it’s not suitable for being eaten by pets, humans, or livestock. 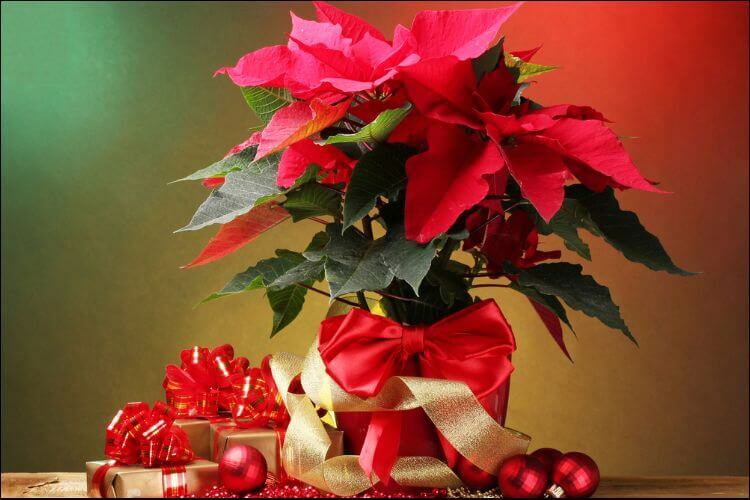 If you ingest poinsettia, most likely you will end up with a stomach upset, but this happens with most houseplants. Scientists have tested the plant repeatedly and found no evidence that it is toxic or unsafe to grow in the house. Moreover, you can safely add it to your compost as well. 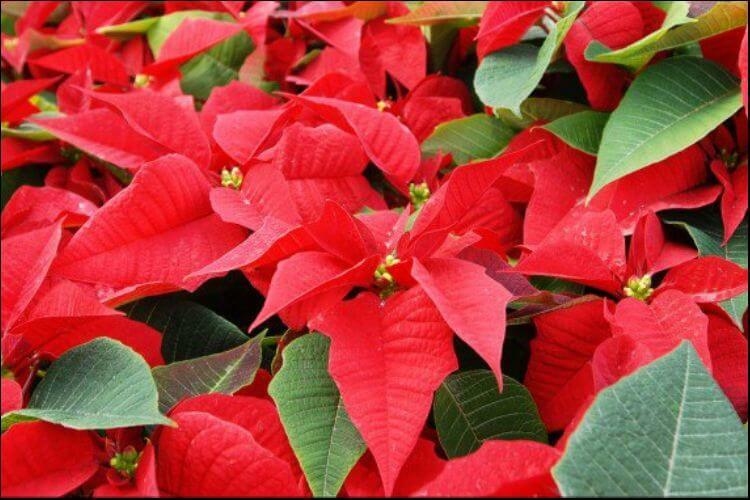 Poinsettia is a great plant not only around Christmas but all throughout the year. If you receive such a plant as a gift, it’s a good idea to learn how to care for a poinsettia plant on your own and keep it long after the holidays are over. The process isn’t a difficult one, but you will need to be patient and diligent with your efforts.